The upper denture Jack Saurwein wore for six years did not cause him any discomfort. But, in his words, it was a "nuisance." After having it relined several times, it still slipped frequently instead of staying comfortably in place. Jack was familiar with dental implants and had followed the history of their development from the very early stages. So after discussing the option with several dentists, he decided to have the procedure performed. In Jack's case, six implants were surgically placed in his upper jaw, three on each side. 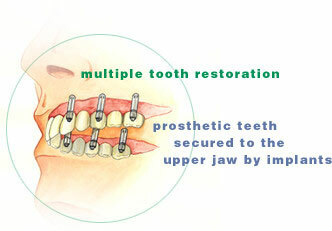 Prosthetic teeth were then attached to the implants so that only the dentist could remove them. Jack describes the discomfort he experienced during surgery as mild, and he is extremely pleased with the results. "There are no teeth to take out or put in, and I'm not as concerned about breaking a denture," Jack says. "There's a feeling of security I didn't have before. Life is simpler and I'm a great deal more satisfied with the appearance of my mouth."